On October 19, 2015, the Friends of Badia launched a Thunderclap campaign to Stand Against Forced Evictions in #BadiaEast Lagos Nigeria. 112 persons signed on and the campaign message – “I’m standing in solidarity with the #BadiaEast community in Lagos Nigeria to demand an end to forced evictions! http://thndr.me/hXSkPh”- reached 175,355 people directly. Thunderclap is a tool that allows you to create a message that people can sign up to allow the application to “blast out” (i.e. share) at the same time- as part of a coordinated campaign- on any specified social media platform (Facebook or Twitter). It is useful for trying to get a topic to trend on social media at a particular time. When a hashtag trends, the social reach is significant and people on social media, especially journalists pay attention. For several weeks, 18 concerned individuals and civil society organizations working under the auspices of Friends of Badia worked together to co-create the campaign video and messages, and agreed on a time for the campaign to blast. ThunderClap is built to work with the power of crowds: so the civil society groups conducted a pre-campaign promotion to solicit for, and commit to getting at least 100 social media accounts (individual Facebook pages and Twitter handles) to share the campaign in order for the message to blast out. 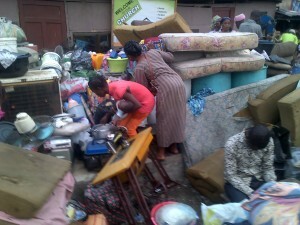 Help us demand that the Federal Government of Nigeria and the Lagos State Government: refrain from, prevent, and protect against forced evictions, provide immediate humanitarian assistance to those already rendered homeless, and ensure that these persons are compensated for all their losses. October 18th marks one month since the initial evictions started, people rendered homeless are still living in precarious positions, no assistance with shelter or other basics of life. Instead, evictees get more harassment, and destruction of improvised shelters. No matter where you are, will you stand in solidarity with Badia residents? Join our virtual day of action campaign! We can join our voices with those of Badia residents and issue a collective message. We’re asking you to sign up and lend us time-limited access to your status updates on Twitter and Facebook. With it, we’ll send out a single message en masse to tell the Federal Government of Nigeria and the Lagos State government to hear our demand! PreviousPrevious post:The National Clean Cookstove Scheme: The Challenges WithinNextNext post:Stop Further Attacks on Badia Evictees, Now!